Early slave owner portraits reflect the complex and layered story of black people in the United States. Many early 19th century artists depicted images of slaves serving alongside their masters. They are depicted with some of our founding fathers including Brigadier General George Washington who became our first President. Is the slave performing a particular task? Is it associated with a particular occupation, hobby, etc.? Look for personal records, estate/probate records, inventory and appraisal records, diaries, family bible, etc. of the slave owner. They often listed the first names of their slaves, gender and approximate age. For instance in the oil painting below of General Washington, the African American man holding the horse is unidentified, using the above steps would conclude that he is more than likely his slave William Lee who he freed after his service in the American Revolutionary War. In researching General Washington's papers and writings, he mentioned the name of a close slave servant as William Lee, whom he purchased from another plantation. Lee was allowed to keep his surname. 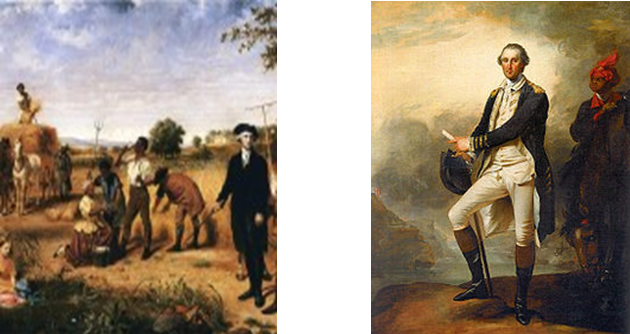 The above two paintings also show General Washington with his servants. The main black male image depicted is in fact William Lee. So it can be concluded that William Lee is the most likely identification of the painting of him holding the horse. Further, in the John Trumbull's painting, William is shown on top of a horse. In 2006 the African American man kneeling behind the table and roasting sweet potatoes in the fire was identified as Oscar Marion. 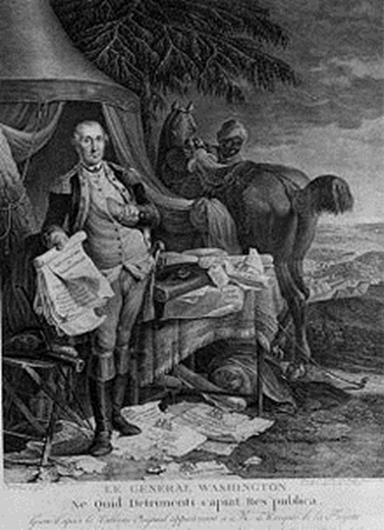 Oscar was referred to as the "faithful servant" of Brigadier General Francis Marion, the "Swamp Fox" whom he accompanied into the American Revolutionary war and fought alongside him throughout the entire 7-year war. Oscar chose the deliberate path of patriotism. I sponsored a commemorative ceremony at the U.S. Capitol in December 2006 where Oscar Marion received post-revolutionary recognition after 230 year for his heroic service including proclamation from President George Bush and U.S. Representative Albert Wynn. The U.S. Senate Curator's Office has now updated their official records and website to reflect this American Patriot's name. Before the Civil War, money was printed both by the Confederate States of America and by the banks of the individual Southern states. Southern banks enshrined slavery in their monetary system to remind those who came in contact with their bills that the institution was the region's economic bedrock. The "Sweet Potato Dinner" painting was printed on confederate notes in denominations of $5 and $10. General Francis Marion's Sweet Potato Dinner -- SC, $5 Post War Note, Criswell (Type 5), March 2, 1872. 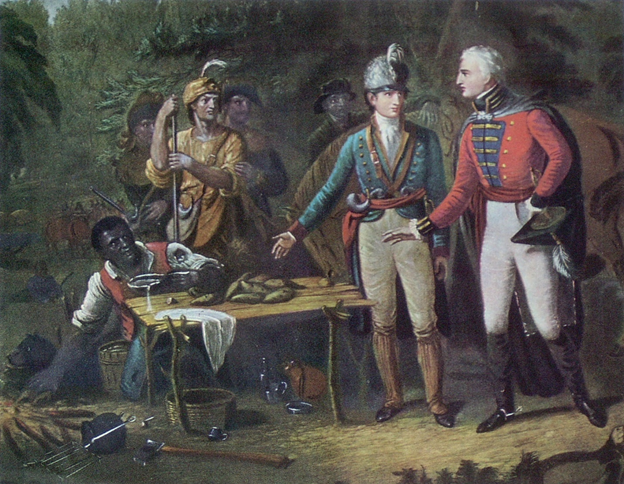 General Francis Marion offers a dinner of sweet potatoes to British General Banastre Tarleton (1754-1833). Brigadier General Thomas Sumter (1734-1832), Member of the South Carolina House & Senate; Congressman & Senator (at lower left), Major General William Moultrie (1730-1805); SC Senator; Lt. Governor; Governor (at right). General Francis Marion's Sweet Potato Dinner -- Confederate States of America Currency, $10 Note (Type 30), September 2, 1861, third issue, B. Duncan, Printer/Engraver. Brigadier General Francis Marion offers a dinner of sweet potatoes to British General Banastre Tarleton (1754-1833). Robert Mercer Taliaferro Hunter (1809-1887), Confederate Secretary of State (at lower left), Minerva, the Roman Goddess of War (at right).